Picture a librarian. Do you imagine a bespectacled man or woman, lips pursed, eyes narrowed, whose voice barely rises above a whisper? Do you think of a person who prizes organized shelves, books returned on time, and above all, QUIET? I do. 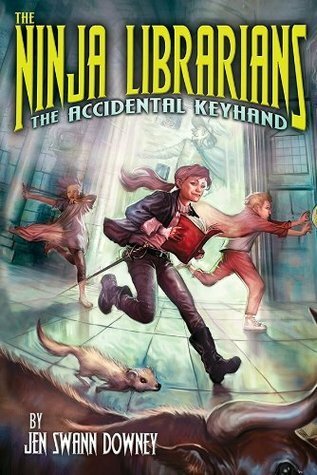 Or at least, I did, until I encountered the librarians in Jen Swann Downey’s rollicking and thought-provoking THE NINJA LIBRARIANS. The title alone indicates that this is something special: what do ninjas—those black-clad silent masters of combat—have to do with the book-loving, shushing librarian? Well, it turns out it’s not about silence. It’s definitely not about silence. The librarians in Downey’s world are specially trained warriors sworn to not only catalog books but also to protect them and their authors from those who would silence them—anywhere in the world, throughout history. And twelve-year old Dorrie Barnes would love nothing better than to join them. Dorrie longs to fight real evil with a real sword. The best she can do, however, is wield her play sword at the local library’s “Pen and Sword” festival. But when a friend’s pet mongoose gets loose in the library, Dorrie and her brother Marcus chase him into a janitor’s closet and literally fall into a secret library. Petrarch’s library is the headquarters of the Lybrariad—a secret society of lybrarians who work tirelessly to preserve and protect the written word. The Library itself is connected to hundreds of smaller libraries throughout the world and throughout time. Lybrarians can jump into ancient Athens or sneak into seventeenth-century Paris. But when Dorrie and Marcus crash unexpectedly from twenty-first-century New Jersey, the lybrarians are wary. How were they able to get in? Are the children spies from the Lybrariad’s arch-nemesis, the Foundation? Dorrie desperately wants to stay and train with other kid apprentices from around the globe, but will she have to give up her home and family in New Jersey to do so? I find this refreshing in a genre populated by special-ability kid heroes (and I love those heroes and am writing one myself). But what does set Dorrie apart is her desire for her deeds to make a difference. During her stay in Petrarch’s library, she becomes apprenticed to the great swordsman Hercule-Savinien de Cyrano de Bergerac, known as Savi. Savi and Dorrie challenge each other, creating many wonderful who-is-the-master-who-is-the-apprentice-scenes. But one of the most significant moments occurs when Savi asks Dorrie whether she wants to apprentice to a swordsman or to a lybrarian. Dorrie grapples with the question, eventually realizing that the sword must serve the pen. Sword-fighting adventures are all well and good but the Lybrariad’s work means something—the life or death of writers and their voices. Voice is what THE NINJA LIBRARIANS is all about, whether it’s the lybrarians racing to save an endangered manuscript, Savi seeking his voice with the woman he loves, or Dorrie finding the courage to speak the truth even if it lands her in trouble. There’s no shushing. Everyone is encouraged to speak—be they worldly-wise historical characters, mean girls, or bad guys. Downey’s narrative voice embodies them beautifully. The novel brims with a love of language, bubbly with words and turns of phrase that alternately gave me the shivers or made me laugh out loud (especially whenever Marcus speaks). The book’s voice and diverse characters will appeal to many Middle Grade readers hungry for stories about the interaction of kids from different times and places. Teachers will find the novel a useful springboard for discussions about freedom of speech. Plus, the historical characters provide useful cross-curricular opportunities. As back matter material THE NINJA LIBRARIANS includes a guide to Petrarch’s Library with descriptions of the historical characters and places. But I think librarians and those who love libraries will appreciate THE NINJA LIBRARIANS most of all. We library-lovers have known all along that there was something special about librarians and libraries. It’s not the smell of paper and ink. It’s not the quiet. It’s definitely not the shushing. It’s the sheer volume of so many collected voices, accessible to all who want to hear them. Now when I enter a library, I’m tempted to peek into the janitor’s closet and look for the entrance to Petrarch’s Library. I haven’t found it yet, but that’s okay. Thanks to Downey, I know it’s out there somewhere. Carolyn Fay instantly relaxes whenever she walks into a library, and often has to be pried out at closing time. She writes fiction and non-fiction for children’s magazines, including Highlights for Children, Calliope, and Dig. Her current project is a Middle Grade fantasy novel about an extreme introvert. Find her online at http://www.carolynfay.com or on Twitter at @feecaro. Thanks for the review. I just recommended this to three of my students. I hope they’ll pick it up! What fun! I’ll have to hunt this one down. This sounds like a lot of fun! Adding to my to-read list!